Heat Shield | Permian Basin Chimney Smoke Chamber Repair | Call.. Smoke chambers must be built to meet current building specifications of the International Residential and Building Codes (IRC). Smoke chambers are to be built to certain size, shape and are even supposed to be parged. “Parged” is a fancy word for covered or in this case, covered smooth as this provides extra durability, safety, and better drafting performance. What is a smoke chamber you ask? The fact is most chimney owners do not even know what a smoke chamber is, let alone its purpose. 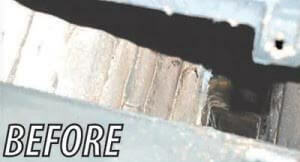 The smoke chamber is the open cavity located just beyond the damper flap and just below your flue. It kind of resembles an upside down funnel. Most smoke chambers are constructed of bricks or even cement blocks with no more than 1/4″ mortar joints. Upon visual inspection, the smoke chamber should appear smooth from top to bottom with no visible bricks, blocks or their mortar joints. If a smoke chamber is not originally parged or is found to only be partially parged, then that smoke chamber would not be to IRC code. Our chimney professionals would notate this in his inspection and discuss cost for parging your smoke chamber. The process for parging can be difficult given the tight nature and location of the smoke chamber. However, we specialize in parging smoke chambers and take the worry out of this procedure for you. Our professionals have specialized, tools and applicators to accomplish this task. Heat Shield Cerfractory foam smoke chamber sealant and restoration system is sprayed into the smoke chamber to insulate it and to smooth jagged edges. As the product dries, it expands up to 50%, creating a rock-hard foam that resists temperatures of up to 2,550*F and is listed to UL2505. The Heat Shield smoke chamber restoration products come with a 20-year limited guarantee. 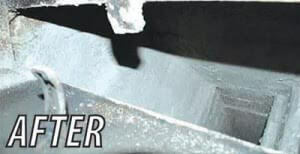 The guarantee is for the Heat Shield product, that is installed at the specified address, in the masonry chimney indicated, shall be free from defects in materials when servicing residential appliances or an open fireplace and when professionally cleaned & inspected on an annual basis. 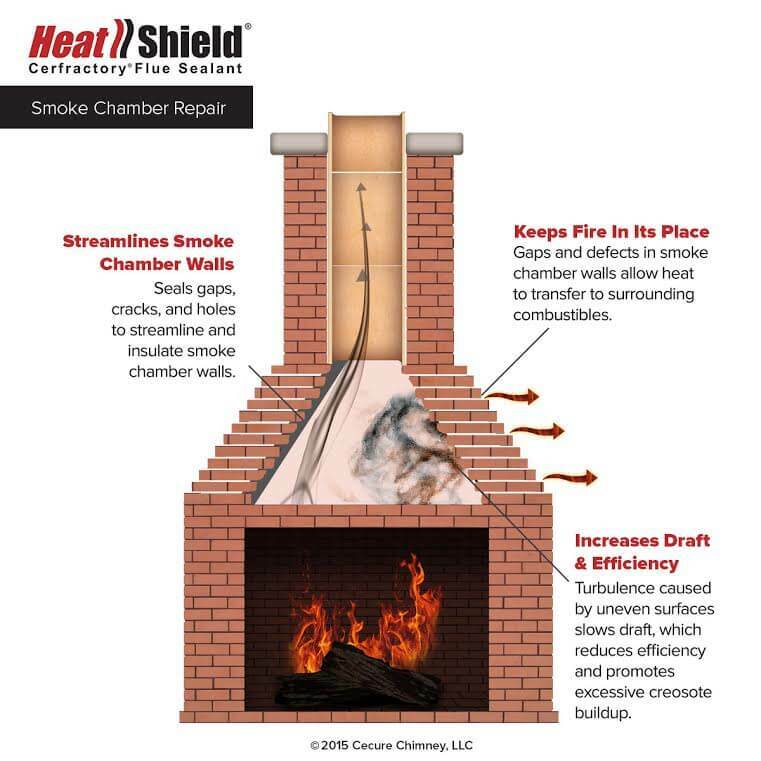 The maintenance of the Heat Shield smoke chamber is the responsibility of the homeowner. Dated receipts verifying annual service must be retained. In the event you sell your home, the guarantee is non-transferable. The guarantee does not cover damage to Heat Shield products that is a result of a chimney creosote fire, foundation settlement, abuse, alteration, or the burning of garbage, railroad ties or other chemically active substances. You may make a claim under this guarantee by giving written notice to “Bill Placer’s Hearth and Home Shop”. Upon approval of your claim, materials shall be provided at no charge (exclusive of labor) for the repair. Such replacement will constitute the limit of liability and obligation.